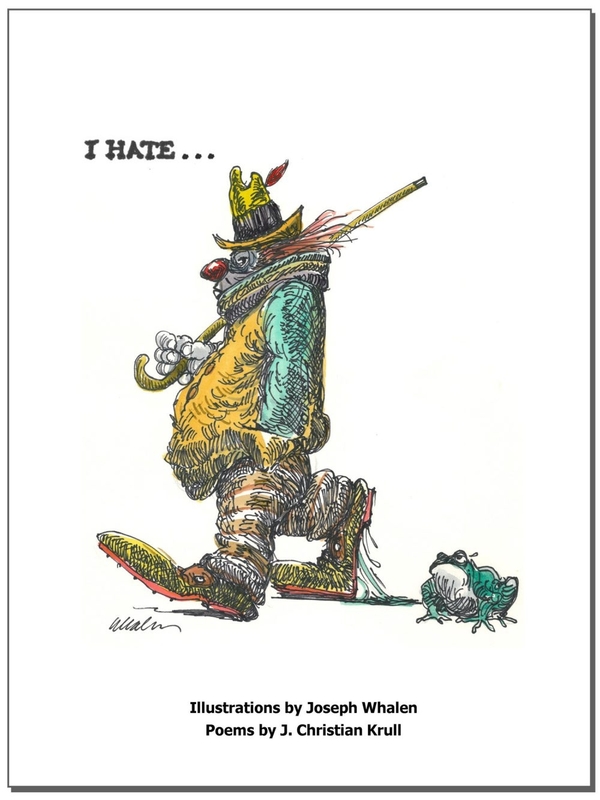 This the cover of the book “I Hate … ,” written by Jay Krull with illustrations by Joseph Whalen. LOCKPORT – Recently rediscovered works of Lockport artist Joseph Whalen, combined with the poems of Niagara Art Trail promoter Jay Krull, comprise a new book being launched this week. The work will be signed by Whalen and Krull from 11 a.m. to 1 p.m. Saturday in the Market Street Art Center, 247 Market St. The book, which retails for $30, will be sold exclusively in the Art Center’s Art & Soul gift shop during May, before it’s offered in other outlets. The book also will be available on the Niagara Art Trail website. Also on sale at Market Street will be prints, greeting cards and other pieces using the illustrations by Whalen that are featured in the book. The book is based on a series of 15 works by Whelan around the theme, “I Hate …” And that’s the title of the 32-page book. Whalen said it’s not serious hatred. “It’s like, ‘I hate Mondays,’ or ‘I hate large rabbits,’ ” he explained. All the pictures depict a clown in conjunction with an animal. “Every clown is different. Every animal is different,” Whalen said. Some of the originals are watercolor paintings, and others are pen-and-ink drawings. Whalen said he created them about 25 years ago – he no longer remembers why – and set them aside. “I must have been idle. If you’re idle, things take over your mind,” Whalen said. “I was going to do a book with them,” the artist said. About two months ago, his son was doing some framing for him and came across the ‘I Hate …” cycle. It was Whalen’s idea to present the pictures to Krull and ask him to supply poems that could go along with each. Krull’s short poems attempt to capture the whimsical nature of the Whalen illustrations. “Although there’s humor in it, there’s a point, too,” Krull said.